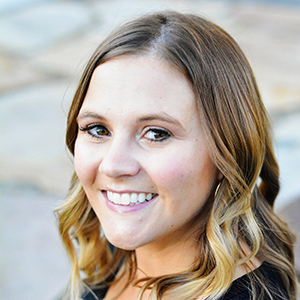 I have a sweet giveaway for you today! 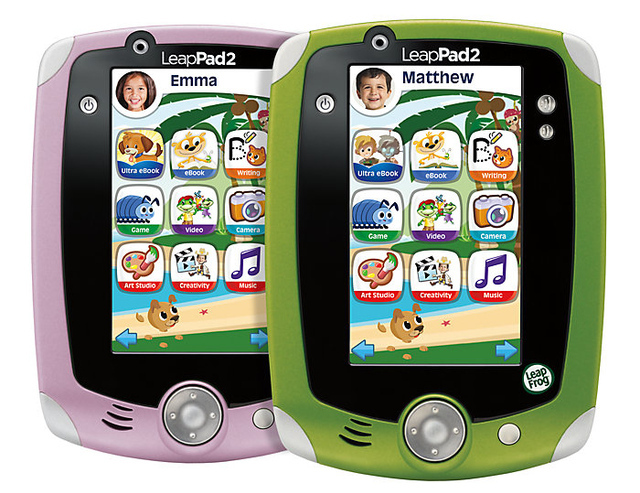 How would you like to win a Leappad2? And a cool new game cartridge called Minnie’s Bow-tique? AND a $25 app gift card to Leapfrog? Um…yes??? First let me tell you a little about this new game. It’s really cute. And if you know anything about me, you know I have two little boys and a baby girl. So obviously my baby isn’t going to be playing this game. And my boys still enjoyed it. It’s really cute. You can go into the game and choose from a variety of games within to play, each which teaches a different skill to your child and lets them easily earn bades. And you can made enough bows for Minnie’s party guests to all wear one! This game teaches matching, dexterity, artistic design, etc. My kids loved earning the stickers and badges. For each badge you earn, you can plug in your LeapPad2 or Leapster Explorer to the computer and download a bunch of new things to play on the game. The game keeps evolving as your kids unlock new badges! I recommend this game for any child who enjoys playing the LeapPad or Leapster Explorer (it works on both.) I have to say, most girls will probably play it for longer than boys. And now to the giveaway! 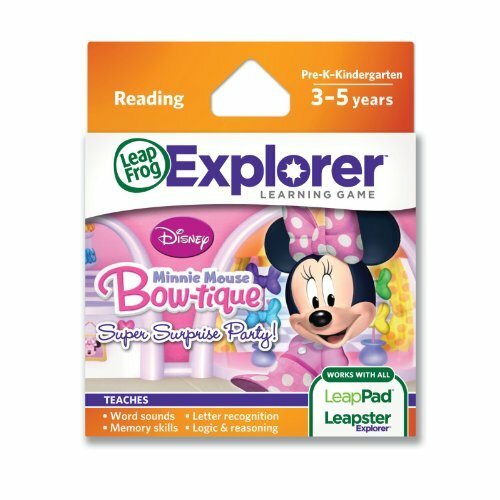 This giveaway is for a LeapPad2 in either green or pink color (you choose), the Minnie’s Bow-tique Game Cartridge, and a $25 Leapfrog app gift card! This is all valued at $150! I bet you can think of a little kid who would like to have these awesome prizes, right? I know several little ones that would love this! My grand daughter Madison would love this for sure! Thanks! My four year old daughter asks for one every time we go down the toy aisles. Awesome giveaway. We love the Leapfrog brand. Fun and educational toys thatthe kids enjoy. My soon to be 3 year old would love this for his birthday! My 6 year old son would love the leapad I think. My four year old daughter!!! My two daughters would love this! Thanks for the giveaway! All 4 of my kids would love it! My little foster grandson would love this! Oh my granddaughter would love this. I almost bought it for Christmas. My 4 year old son would looooove this!! We have been working on rhymes and I’m sure there is a game on the leaped to help with that!! I sure hope we win!!!! Thanks for the chance! Definitely my daughter would love this! My daughter would LOVE one of these!! My youngest would love this, she can play with it while my older daughter works on her homeschool stuff! Thanks! Lovely giveaway. I just wish I could do the other entries. I don’t even know how to tweet but I do know what it is. As for instagram, I don’t even know what that is. LOL.. can’t keep up with every thing that comes out. My grand daughter would just love this. Thanks for a great giveaway. My daughter Kayla Rae would LOVE this!! Ooh my daughter would love this! She is such a Minnie Mouse fan! My daughter’s 3rd birthday is Saturday and I know she would LOVE it!!! Thanks for the great giveaway! My 3 year old would love this! And I would love it more than him always wanting to steal my iPad! Any of my five oldest children would be delighted with this, and the sixth would be happy to observe! My girlie would lOOOOOve this!! My sons love the one leap pad we have, it would be great to win a second one! My girls would both love this. My older daughter’s leapster stopped working and she’s been begging for a new one. This would be better. My son would love this! His sister has one and he’s always wanting to play it! Thanks for the giveaway! I would love to win this my 3 kids age 6 and under would love it! My little guy would love this!!! I have a two year old daughter that would love this!! My daughter got a princess leap pad 2 and now my boys envy her. Couldn’t afford to get all three of them one. It would be nice for the boys to share one, not girly looking. My kids would love this, but it would be absolutely perfect for my little girl’s birthday!!! my daughter would love this! she’s still young, but would be ready for it in no time! At 14 months she already knows all the basic functions on my phone. I have a couple of nieces that would love one! I have a 3 and a 5 year old who would love this!! My 3 year old daughter! She got the leapster for Christmas but she left it on the floor and accidentally stepped on it breaking the screen. She loved that and misses it so much! My daughter would love it! She is tired of being surrounded by boy stuff. She would like to have something with girl colors and it would be a great opportunity for her to learn some new stuff. We are driving from Indianapolis to Orlando this fall. One of these would make the trip so much more enjoyable! I’ve been wanting to buy this for my son’s birthday in May! My 5 year old keeps asking for an iPad but I think she would enjoy this just as much! My daughter’s birthday is just around the corner, and she always tries to steal her brother leappad 2 he got for Christmas she would just LOVE this. I have some nieces in this age range–perfect! I have THREE nephews (my poor brother and sister-in-law have their hands full) and I know this would go over really well with them. I would use the gift card towards a game for each of them so they wouldn’t fight (ha) over the Leappad. My daughter was wanting one of these for the grandbabies. I would love to win this for my granddaughter’s birthday that is on March 19th! Would love to win for my grandchildren!!!!! My special needs students would love to work with this! Love this giveaway!! Another way to distract my kids! My nephew Max would get a kick out of this! What an awesome give-a-way! My daughter would love it. My sons would be so thrilled to win this! My grand-babies would LOVE it! The oldest is 3 1/2 yrs. old & Minnie’s Bowtique is one of her favorites! Thanks for the giveaway! My granddaughter would like this very much. Thanks for the giveaway. My son would LOVE this. He is begging to learn to read right now and I know this would just help him and me since I have other little ones to take care of too. My four year old would seriously love this!! I have been wanting to get one of these for my niece! She’s growing up so fast! This would be a wonderful learning tool for my Granddaughter who is temporarily living with us, along with her parents. It would also benefit my other 2 Grandchildren who come to visit us. My great niece would love this, thank you for the opportunity. We would love this for our foster kids! My littlest yells, “SHARE!” everytime big brother gets his out. She wouldn’t mind her own (and neither would I). my son and daughter would really enjoy it! We would DIE…this would be SO awesome!!! My son and daughter would enjoy it. My 4 year old would love this prize! My little girl would be SOOO excited! She has wanted one since they came out and LOVES minnie! So fun! I’d love to win this for my niece. Thanks. Either of my kiddos! We need more learning songs! I wanted to get this for my two year old for her birthday but my husband thought she was too young. She’s a pro at the iPad so I know she would LOVE her own thing! My granddaughter would love this to learn to read. My daughter, Lily would love this!! She has been trying to steal her brothers leappad for about a year now!!! She doesn’t like that he doesn’t have any “Girl” games either! My 3 year old girl and 2 year old boy would love this!! Minnie is a fav, my daughter would have a blast. Thanks!! I know a little girl that would love this! She’s always playing with my son’s LeapPad when she comes to play! :-)Thanks for a chance to win! My 3 year old daughter would love this!! My little boy LOVES the LeapFrog shows and I’m sure he would love this too! My 2 and a half year old would love this! She is always getting into her big brother’s! My daughter who is almost 5 would love this! Pretty sure this would save my sanity this summer as we drive back across the entire nation. 32 hours in the car would go a lot smoother with this baby…..